Milwaukee Daily Photo is on vacation thru Saturday, and you're invited to come along! Today, we went to the Phoenix Botanical Gardens to see the installation "The Nature of Glass" by artist Dale Chihuly. 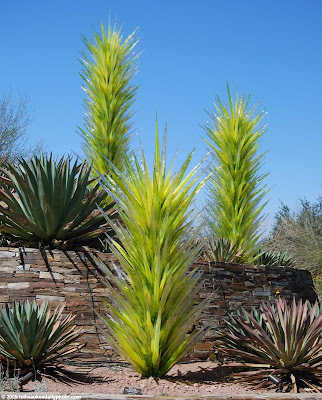 This display shows large glass sculptures mimicking the shape of the agave plants they are installed next to. There are quite a few pieces in the installation, and their color and shape make for a very attractive display among the plants. If you get a chance, go back and check it out in the evening. It all looks completely different while lit up at night. Someone's been visiting one of my favorite places. Have fun.